Moist and flavorful, this Easy Cornbread Dressing makes a delicious side dish for chicken or turkey! A definite must-have for the holidays! 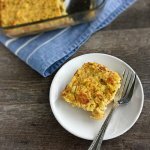 My favorite dish at Thanksgiving has always been southern cornbread dressing. My mom makes the best chicken and dressing of anyone I know. It’s always perfectly moist and well seasoned. I know that everyone has a different opinion on what dressing or stuffing should be like. Some recipes call for cubed pieces of bread, but this is closer to the consistency that I grew up with and prefer. My mom used a combination of cornbread and french bread, but I make mine with just my Skillet Cornbread that has no wheat flour in it. Not only is it just as delicious, but this is also a way to make it gluten-free. Just make sure that your cornmeal and chicken stock are certified gluten-free. I like the Arrowhead Mills brand of yellow cornmeal. I cooked a pan of my Skillet Cornbread to make my dressing, but you can use your own favorite cornbread for yours. I only needed half of the pan of cornbread to make this small batch. Do NOT use sweet cornbread for this recipe. One of the keys to a good homemade cornbread dressing is making sure your cornbread is really dry before you begin this recipe. Make it a couple of days ahead and place it in a bowl or storage bag and leave it on the counter. Then, crumble it up into really small pieces in a large bowl. The second trick to making the best cornbread dressing is to use enough chicken stock. The mixture should look a bit soupy before going into the oven. If you don’t use enough stock, it will end up dry and no one wants that! 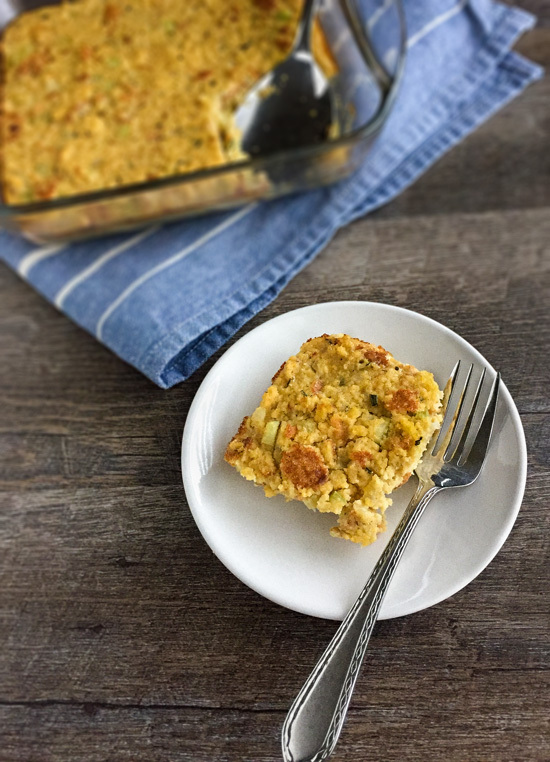 This cornbread dressing recipe will serve up to four people, so it’s perfect for a small Thanksgiving dinner or for when you just have a few guests who eat gluten-free. Preheat oven to 350°F. Grease an 8x8 baking pan. Place crumbled cornbread in a large bowl. In a 10.5-inch skillet, melt the butter over medium heat. Add the onion and celery and cook until tender. Add the veggies to the bowl with the cornbread. Add the seasonings and mix together, then add chicken stock and mix again to combine. At this point, you can taste and adjust if necessary. Pour the egg into the cornbread mixture and stir to combine. Pour into the prepared baking pan and bake until dressing is cooked through, 30-45 minutes. Serve hot. Cook times will vary based on amount of stock used. By Tempie at November 2, 2018 .